The rest of the Jalopnik crew made fun of me for going gaga over the 2015 Chevrolet City Express van's cargo management features. Whatever, I say OEM cargo shelves are kickass and I don't care who knows it. I also love the flat surface attached to the back of the passenger seat. The seat folds forward to make a desk when the front right seat isn't occupied. Why haven't I seen that in a van before? The rest of the tidy little van's 122.7 cubic-foot cargo area is decked out with tie-down points. But the floor's pretty flat, and the wheel wells are wide enough to accommodate a standard 48" pallet. As for the shape, well, don't listen to the other guys— it's not "just a van." Check out the sculpting on the front bumper! Tail lights are pretty slick too, if you ask me. 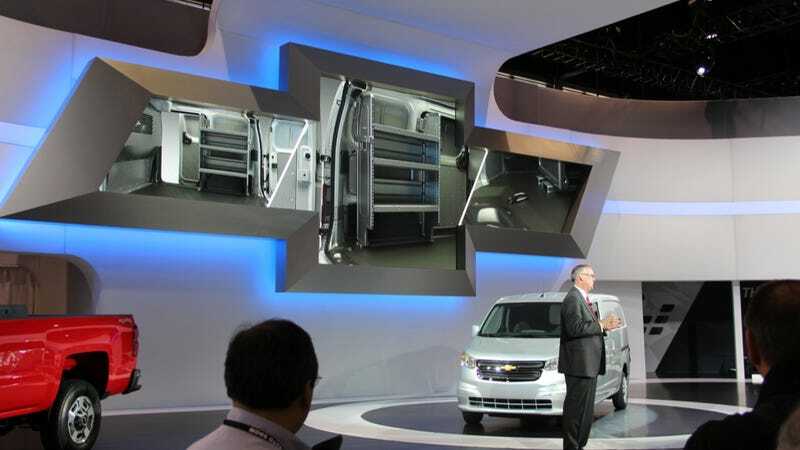 The 2.0 four-banger powered City Express will not replace GM's existing Cargo Van, but be the GM alternative to the Ford Transit and Ram ProMaster City in what my colleague Aaron Foley pointed out is becoming a busy market.